• Low Cost and EASY installation. 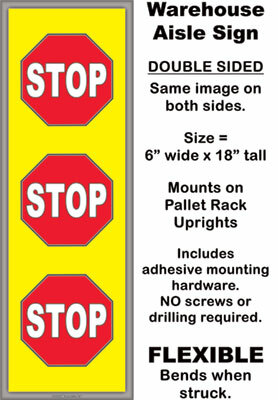 • Aisle Intersection Signs for your Pallet Rack Uprights. FLEXIBLE, bend when struck. CLICK HERE to order. CLICK HERE to download our informational PDF. INNOVATIVE NEW Low Cost Approach. © 2017, SafetyBanners.Org. All Rights reserved. Patent Applied For. Our forklift intersection iMarker™ safety floor stickers are built to go on the floor IN YOUR FORKLIFT AISLES where your forklifts travel - They are Forklift-Tough™ Our forklift intersection safety floor stickers and hanging banners promote forklift and pedestrian safety in a warehouse and manufacturing environment. 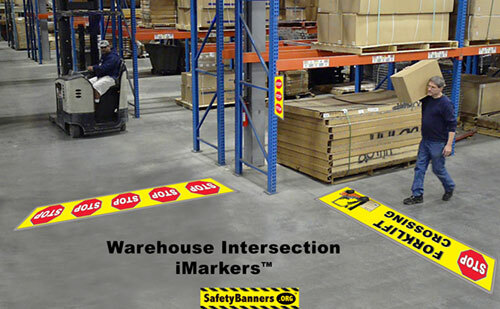 All SafetyBanners.Org intersection floor safety stickers are Forklift-Tough™, non-slip, and designed to go in the forklift traffic aisle. The intersection is one of the most dangerous places in a warehouse environment. Forklift pedestrian accidents are one of the most reported warehouse incidents. Merely making pedestrians and drivers aware of an intersection can go a long way in accident prevention. 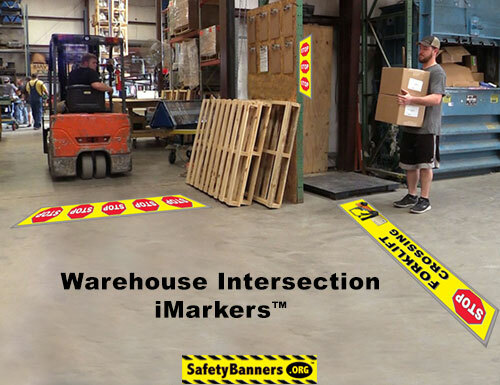 Sometimes a floor sticker is hard for a forklift driver to see, so all our our intersection safety floor stickers are also available as a banner which can be hung above the intersection. Need a custom intersection safety design? Call us - 901-759-0932 - to design one for your particular situation. Forklift / Pedestrian Intersections in a warehouse or any facility can be a very dangerous area. There are a lot of very expensive attempts as solving forklift vs. pedestrian accident solutions. Some work and some not so much. At the end of the day, keeping intersections safe boils down to awareness and forklift drivers and pedestrians paying attention to what they are doing at all time. Distractions and carelessness are the two main causes of intersection accidents. Our goal here at SafetyBanners.Org is to come up with simple, easy to install low cost methods for intersection safety. 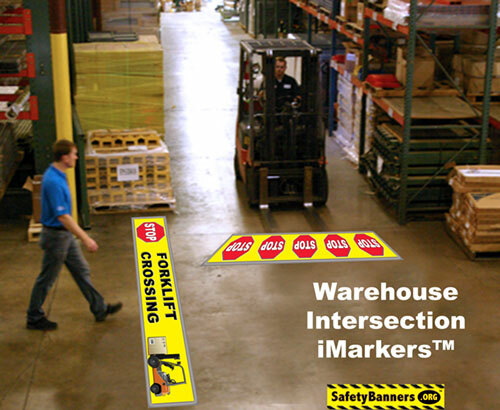 Our forklift intersection safety floor stickers and our forklift aisle are two of our ideas. Strong but Flexible unlike dangerous metal aisle sig ns. INNOVATIVE NEW PRODUCT. © 2017, SafetyBanners.Org. All Rights reserved. Patent Applied For. Patent Applied For. Our Forklift Safety Aisle Signs bend when struck unlike dangerous metal signs. Our Forklift Safety Aisle Signs are used for IN-AISLE, EYE HEIGHT safety awareness. They come complete with adhesive backed mounting brackets for your upright support beams or any flat surface. (No drilling or screws required!) They are SUPER EASY to install. They are narrow, 4" wide by 16" tall, double-sided vertical signs, directional in nature, for forklift and pedestrian intersection safety. Flexibility means they bend when struck by a forklift or pedestrian. We made them narrow so they would not interfere with pedestrians or even forklifts in the aisle. However, the design is psychologically eye catching and visually attractive so it is more noticeable than those old style 90's looking signs. They can be placed at eye level without fear of injuring your people which increases the visibility of the sign and the safety message. You have never seen anything like our Forklift Safety Aisle Signs for in-aisle safety and accident prevention and awareness. Built Ultra Durable and Factory-Tough™ for our American Industry. © 2017 SafetyBanners.Org, All Rights Reserved. All images and designs are the property of SafetyBanners.Org. Patent Applied For.